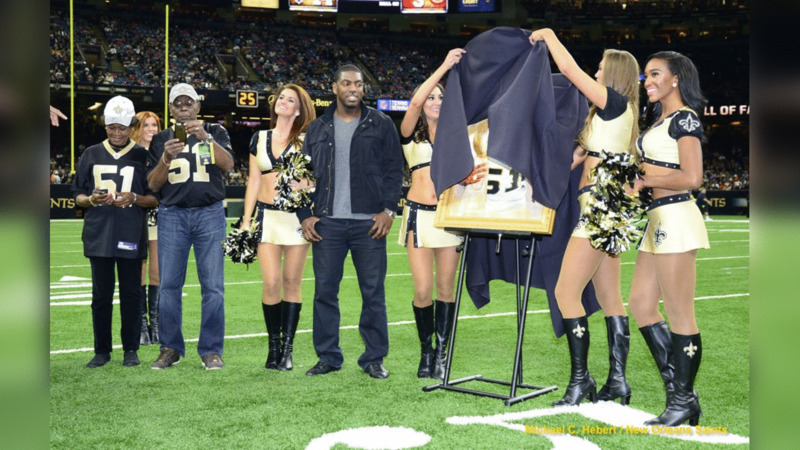 Recent Saints Hall of Fame inductees Jonathan Vilma and Carl Nicks were honored on field during the Saints' 20-12 win over the Bears in Week 8 at the Mercedes-Benz Superdome. Former New Orleans Saints linebacker Jonathan Vilma was selected as one of eight new active members for the 2018-2019 Orange Bowl Committee. The Orange Bowl will host College Football Playoff Semifinal at the Capital One Orange Bowl on Dec. 29, 2018, the 25th annual MetroPCS Orange Bowl Basketball Classic on Dec. 22, 2018, as well as numerous other sporting events and community activities throughout South Florida. Vilma, now a college football analyst on ESPN, was a three-year starter at middle linebacker at the University of Miami where he received his bachelor’s degree. During his time at UM, Vilma was named Academic All-Big East three times, and All-Big East twice. He also won a National Championship in 2001 and was later inducted into the UM Hall of Fame. After being drafted in 2004, Vilma spent 10 years in the NFL, earning NFL Defensive Rookie of the Year honors and being named to three Pro Bowls. He played a large role in helping the Saints win a Super Bowl title in 2009 and was inducted into the Saints Hall of Fame in 2017. The Orange Bowl is a 360-member, primarily volunteer non-profit sports organization that promotes and serves the South Florida community. With its primary mission since being created in 1935 to bring tourism to South Florida through an annual football game and events, it has also maintained a legacy of charitable contributions and community outreach.